It’s getting a tad ugly over at Convict-Con, so we’ll just step away and see how the henchmen are doing until that nasty business concludes. It’s also time for a new Comic of the Week. Witchery, Etc. is a fun, cute adventure story about a young witch and her headless friend as they travel about the world. It’s a nicely done black and white comic, and I’m a big fan of those. Go give it a read. I also noticed a bit of a reader boost the last few weeks. Are you folks spreading the word? I doubt it’s because of anything I did; I’m a tad too lazy for relentless self-promotion. It’s got to be you, then. 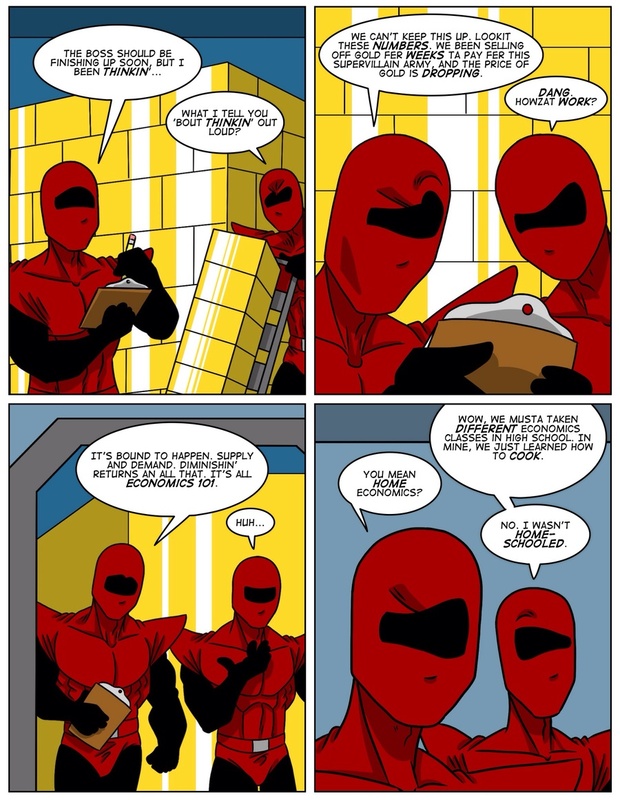 You can leave comments by clicking here, leave a trackback at http://supervillainous.spiderforest.com/comic/goldbricking/trackback/ or subscibe to the RSS Comments Feed for this post. Was this strip due to all the comics about how the price of gold has got to be dropping by now? Like others said, Claw can always switch to some other thing that he can devalue. Although, pretty soon I imagine people might wise up to the whole “What Claw sells will be almost worthless soon” thing. Only if he fails to diversify each time. I mean if he is even able to repeat the former scheme, it is largely a matter of remembering to duplicate several different precious metals, gemstones or anything else of significant value. If it is hard enough to tell the parallels from the originals and/or Claw can find the people who don’t care, he could even duplicate some otherwise “unique” items. He won’t care if (for example) a one-of-a-kind piece of artwork suddenly has 11 duplicates floating around, and if he does it correctly, neither will his buyers. Of course if we need story fodder for the next (next-next?) arc, plenty of “fun” to be had as he perhaps steals the original, duplicates it once and then tries to replace the first duplicate so no one knows… or another super who happens to be a collector freaks out about what he did (since now their collection is less “special). Or perhaps that will be the real thing he sells; duplicating something people want duplicated. Assemble killer collection old fashioned way (through threat, blackmail and maybe even some actual shopping), make copies, sell the lot of them… yes, mostly the same plan but we get to see things like everyone designing a “dream list” of stuff they want (maybe including some returning guest star villains), the effort to steal such things and the hilarity that ensues. That guy on the left seems more like blue henchmen material than red. Ahh… so the question that has been floating around the comments section is starting to get an answer and that answer is “Yes, the price of gold is indeed going down due to Claw selling off so much of it.” The good news is that if Claw can cool things down after this, the market should recover sooner or later; unless someone else is doing this kind of trick, while he’s vastly increased the effective supply on Earth, I doubt he made it common. Got me wondering if he’ll have to try and duplicate something else (preferably a few somethings, so as to diversify his “investments”), which could easily lead to the next story arc (or next-next or whenever). he could always Duplicate Saffron. It’s more expensive than gold by weight and it’s a consumable so if price drops for a while all he has to do is wait and it will go back up. Unless there is some limitation with organic duplication. Come to think of it he could duplicate other consumables such as medicines or drugs. Also platinum is like 10x as expensive as gold so it could probably suffer the deflation of price much longer than gold. Rhodium isn’t recycled as much as gold and is even more valuable than platinum. I guess what claw can do about his money source being devalued depends on the cost vs volume of duplication itself. As I recall, he was unwilling to make a second portal after being only mostly certain that the first one’s creation and use hadn’t doomed an entire alternate dimension. And even the use of this one was based on the acceptance that even though another universe (weird phrase, that) had been destroyed, there was nothing to be done about it at this point so might as well keep going! Note that Claw did make more than one portal, or at least kept the one portal open and allowed it to constantly reset. He also had his lab techs check it out and was pretty sure it wasn’t creating and then destroying a parallel universe. It is just a good reason for him to not constantly spam its usage, because most problems would be solved by it. Not to mention platina being so damn useful. i gues gold is useful in electronics as well, but it’s only useful, not (widely) used. Platina however… so much of our tech doesn’t even work without it, and that is not the only place where we use the tiny amount of platina we have. So devaluing platina due to oversuplying it should technically earn him a honorary hero status.